According to the Forrester Wave™, we stand out for our digital intelligence and aggressive rollout of AI features. The end goal is to provide you with the tools for better customer insight and engagement. 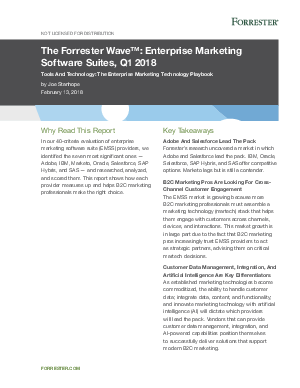 Read more in The Forrester Wave™: Enterprise Marketing Software Suites (EMSS) Q1 2018 report.